Order this grab bag and you will receive 20 different postcards! A fun surprise for anyone who likes snail mail. Send a few to your penpals and keep a few ... Only $0.50 each! These postcards are professionally printed on premium, 215 gsm glossy cardstock, have rounded corners and measure 4.25" x 5.5" (139mm x 107mm). You will get a mix of English (postcard) and French (carte postale) backs. This kit comes nicely packaged in a clear resealable cello bag. What happens when you take up card writing again and you're blessed with a soft spot for surprises? A postcard-sized shopping splurge, of course. Not only are the cards in this pack wonderfully different compared to your run-of-the-mill shop bought ones, I love the whole cuteness factor and the vintage feel of the designs. Admittedly they aren't as thick as normal postcards, but I've sent similar cardstock before and it survived the trip through the mail just fine. Both pretty and such a steal I can recommend these to card-lover's near and far! Are you a fan of snail mail or do you prefer the convenience of sending e-mails? When was the last time you actually sent someone a postcard and what was the occasion? 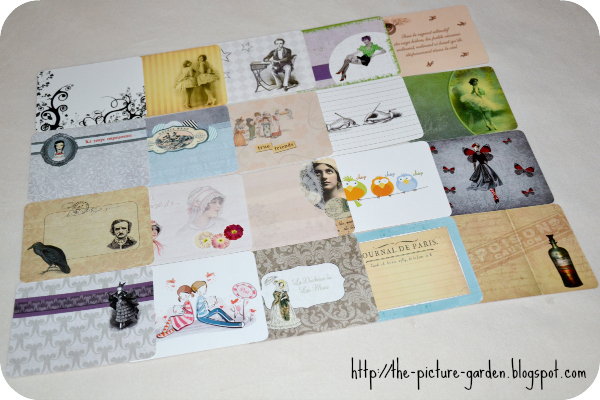 And if these cards get you all excited - have you checked out my recent Postcrossing post yet? I'm getting back to sending more real mail too now. I only wish my handwriting were a bit prettier (and more legible), but maybe I can train myself or simply write slow enough, that might work as well. It does? I'll need to pay attention next time I'm in a super mood vs a bad mood.